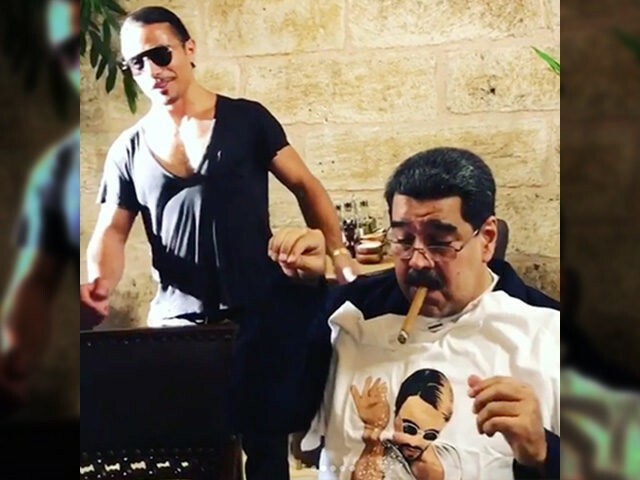 Venezuelans living in Miami have organized a protest for Wednesday against the celebrity chef known as “Salt Bae” after he regaled socialist dictator Nicolás Maduro with steak and cigars at one of his restaurants in Istanbul. “Salt Bae,” whose real name is Nusret Gökçe,” posted videos online Tuesday evening showing him carving meat in front of Maduro and his wife, Cilia Flores, at Gökçe’s Nusr-Et restaurant in Istanbul. The pair were returning from their recent trip to China, where they were seeking further financial aid to help ease the pressure on the country’s current economic meltdown. “This is a once in a lifetime moment,” Maduro can be heard saying. Other videos show him smoking a cigar taken from a box with his name engraved on a plaque, while his wife brandishes a T-shirt with the chef’s image. The videos immediately drew anger from opponents to the regime. Venezuelan lawmaker Julio Borges and Sen. Marco Rubio were among the many to highlight how millions of Venezuelans are starving as a result of Maduro’s socialist program and personal corruption. “While Venezuelans suffer and die of hunger, Nicolás Maduro and Cilia Flores have a good time in one of the most expensive restaurants in the world, all with money stolen from the Venezuelan people,” Borges wrote on Twitter. The images drew the attention of Venezuelans, who highlighted Maduro’s lavish lifestyle compared to the daily struggle of most ordinary Venezuelans. Thousands of people are currently fleeing the country every day in desperate need of humanitarian assistance. Venezuelan exiles in the United States also organized a protest outside the chef’s steakhouse restaurant in Miami to express their disgust at Gokce’s fondness for Maduro, scheduled for noon local time on Wednesday. Before a video of him sprinkling salt in style became an Internet sensation, Gökçe posted a photo on social media wearing a beret and honoring late dictator and mass murderer Fidel Castro. Cuban exiles found the photo after Gökçe became famous in the United States and distributed it widely. In addition to the in-person protest, the review site Yelp shut down reviews of Gökçe’s Miami restaurant after anti-Maduro activists flooded the page with negative, one-star reviews. A study carried out by Venezuela’s top universities in February found 87 percent of the population are living poverty in 2017 with a monthly minimum wage equivalent to just a few dollars a month. A further 60 percent of people lost an average of 11kg (24lb) as a result of a diet lacking in protein and other essential nutrients. These figures are only likely to have worsened as the country’s crisis continues to worsen.